Bob Johnson first joined Medix Ambulance in 1982 as a Medical Explorer Scout. 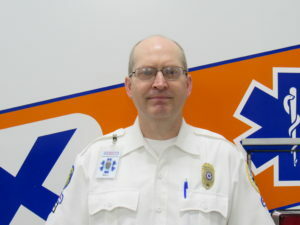 Bob completed his Paramedic training at the Advanced Paramedic Training Program at OHSU in 1987 and interned with Medstar Ambulance Authority in Fort Worth, Texas. In 2016, Bob returned to Medix Ambulance as a Paramedic and Operations Supervisor. Bob worked for Medix for two years as a full-time Paramedic and earned his wings as a flight medic during that time. Bob continued as a part-time paramedic for 12 years after he became a firefighter with the City of Astoria in 1990. Bob completed a 26 ½ year firefighting career with the Astoria Fire Department where he became a lieutenant in 1997. Bob has a firefighting degree from Portland Community College and was on the regional hazmat team for 10 years. Over the years Bob taught EMT Intermediate classes at Clatsop College and was a trainer and early advocate of defibrillation using AEDs. In the early 1990s Bob was instrumental in obtaining grant funding to equip all of the first responder agencies in Clatsop County with monitor screen equipped AEDs. Bob is a leader and a role model for fellow EMS professionals. Bob mentors others and sets a great example for new staff. Medix Ambulance is proud to nominate Bob as a 2017 Star of Life.